The Vyne’s formal gardens are always a hive of activity during the peak season between February and October. Lawns and borders needing our constant attention, roses to be pruned and tied in and battles to be fought with bugs, fungi and various unsavoury characters like ground elder and Japanese Knotweed. A gardeners in-tray is never empty and the weather is always on hand to make life a little more interesting and at precisely the wrong time! This time of year our Yew [Taxus baccata] hedges start to look a little like shaggy sheep in a field in need of sheering. 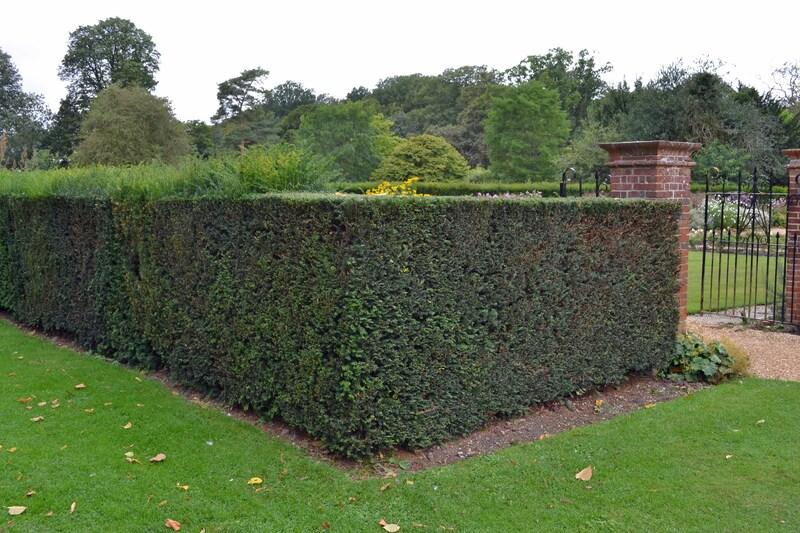 The Summer and West gardens both have significant square metres of Yew hedge which are precisely cut and honed to perfection through the skilful and keen eyes of our gardeners. It can take a couple of weeks to complete the task though our friend the weather has made us hold our hedge cutters a while longer during the exercise and on occasion given a gardener or two a thorough bathing to boot. Shortly the Yew hedges will look like freshly shorn ovines. Clean, sharp edges complimented by perfectly flat tops and 90 degree sides. Once again they will make the perfect frame to our wonderfully varied and colourful herbaceous borders. Should you happen to spend time soaking up the sights and perfumes of this charming garden please pause for a moment and enjoy those frames. Knowing we’ve made your afternoon stroll that much more enchanting and enjoyable is what makes taking an unscheduled shower or two worth while..
As the season draws to a close there are many busy hands inspecting and tending the various fruiting trees and soft fruit bushes both inside and outside our walled garden in the run up to our October harvest event as evidenced below. The fruit is scrumptious so don’t forget to put a note in your diaries. 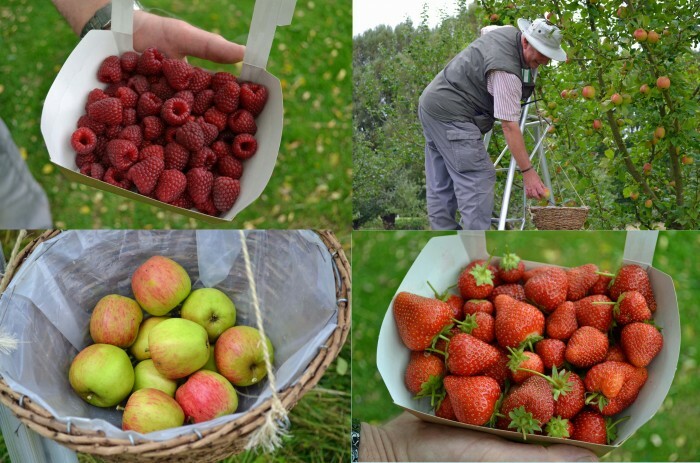 Keith Gillings our fruit harvest guru with a selection of his finest produce.